• Strong, durable polyester shipping labels capable of withstanding harsh conditions. • Label stays intact in all conditions. • No smudging, the address remains easy to read. • Water and dirt resistant, tear-proof, UV and temperature resistant. • Designed for use on any packaging material including polythene or Tyvek® envelopes. 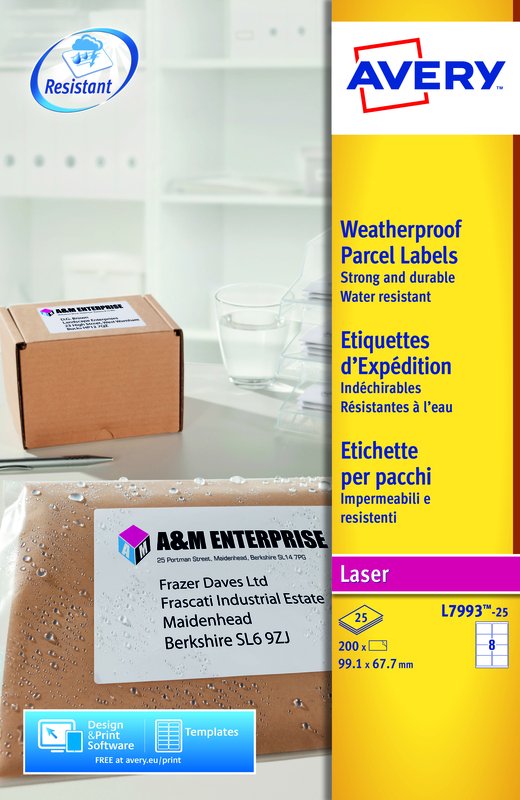 These Avery weatherproof parcel labels are made from extremely durable polyester, which is oil, dirt and UV resistant, as well as waterproof, tear proof and temperature resistant from -20 to 80 degrees Celsius. For use with laser printers, these labels are ideal for use with a variety of packing materials, including polythene envelopes. Each white label measures 99.1 x 67.7mm. 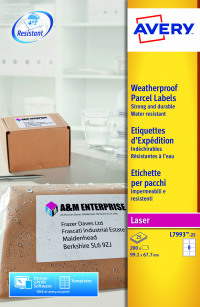 This pack contains 25 A4 sheets, with 8 labels per sheet (200 labels in total).